Zeezok Publishing's Z-Guide to The Hiding Place is a great way to incorporate media into your study of World War II. A watchmaker like her father Corrie ten Boom enjoys working with the needy children of Haarlem. When the Nazis overrun Holland Corrie and her family make a fateful decision to assist Jews and Dutch resistance workers. They construct a secret room in Corries bedroom in case of a Gestapo raid. Betrayed by a fellow countryman the Ten Booms go to prison for their illegal activities. Papa brother Willhem sister Betsie and nephew Kik died while Corrie survived due to a clerical error authorizing her release in December 1944. This guide contains ten learning activities based on this emotionally-charged film. Learn more about the Ravensbruck concentration camp and design your own hiding place. Evaluate your own courage with the Could You / Would You Hide Jews and the Working for the Resistance activities. Plan a survival strategy and map important places from the film. Complete a crossword puzzle and express your thoughts about the horrors of the concentration camps. Engage the entire family with the For Family Discussion section then probe the directors mind with The Filmmakers Art activity. 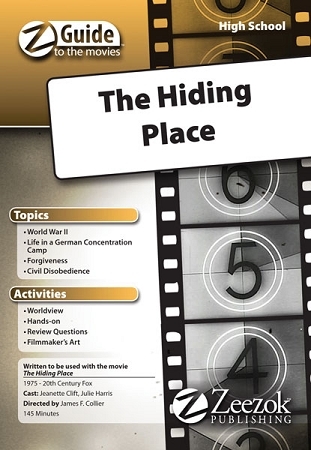 Relive the realities of life in Europe during World War II with The Hiding Place movie guide Intended for use at the high school level. Uses: World War II Life in a German Concentration Camp Forgiveness and Civil Disobedience. This Z-Guide is based on the movie The Hiding Place (1975). You can view a trailer for the movie below.